Happy Monday! Today's #BFC530 Q: "If you could have 1 thing taken off your plate what would it be & why?" 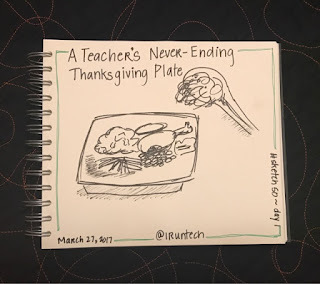 It got me thinking about the overloaded Thanksgiving plate teachers are forced to pile onto each year. Rarely does a school year start where a school or district isn't adopting a new initiative or two, or three, or four...you get the picture. We are constantly adding the new school year's mashed potatoes and cranberry sauce while the offerings from the previous year get moldy, as we haven't had time to properly ingest them. I remember one year, not too long ago, when my district started the year with 5 new initiatives without giving teachers extra time to get it done and/or without taking something away. As K-5 teachers we moved from quarterly marking periods to trimesters, from grades based report cards to standards based report cards, from one lesson plan platform to another, we started using a new student information system (think student attendance and grades and teacher evaluations), teachers started incorporating math workshop into their math instruction. 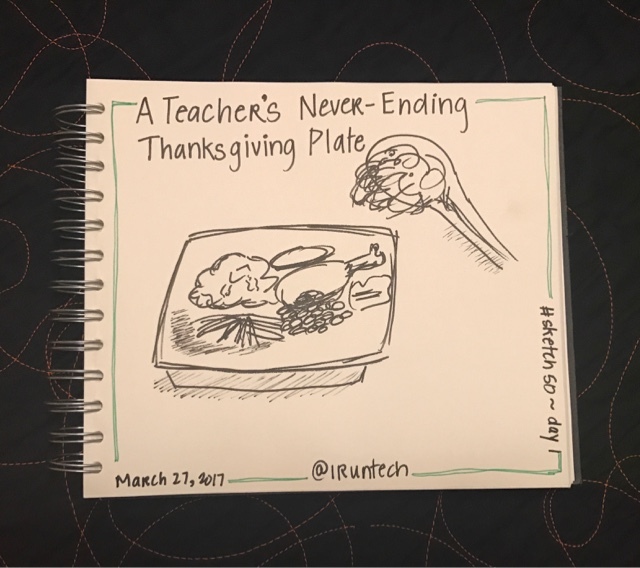 If you are an administrator I implore you to consider what you are taking off your teachers' plates before you add anything new. It's time to cut back on the educational calories we consume throughout the school year. I know I would have a lot more room for biscuits if there was a little less stuffing. It is my practice to open 100s tabs at one time, it looks like I can never world form one tab. This was very helpful. Thank you.